It's kinda crazy to think that this card, of all things, carried me against Hagatha. I got reminded of this card's existence thanks to Spellslinger. Needless to say I was very displeased to see it in my hand. 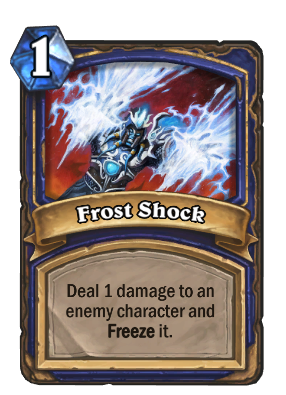 In comparison to Frostbolt this card looks awful. This card should be buffed to deal 1-2 damage. It would be acceptable because shaman is already using a random damage mechanic (Crackle, Lightning Storm, Elemental Destruction). Now that patron is popular, this card seems to be quite a bit better. Use it on a warrior's face when he has a one-charge death's bite, and you can lock him out of his combos for 1 mana. Sadly there is one way to use this card in OTK decks. Use Ancestral Call to put Malygos in, then use multiple spell to burn down your foe in one turn with at most 6 mana. That's where this card comes in, as it costs only 1 and can target hero. Nobody cares about this card.